November 2, 2006. The Judith Regan Show. Lively discussion with Brian and other guests about various diets, including the Longevity Diet. April 8, 2006. Arizona Daily Star. Article about the CR Society's fourth conference in Tucson. "You can get to 100 without having a heart attack or stroke," Dr. Alex Jenkins, conference attendee, is quoted as saying. "The various laboratory tests they've done on calorie restriction are just amazing. I think people are living longer and healthier lives through the innovations of medicine, and this is a more powerful intervention than medicine." April 5, 2006. New York Times. 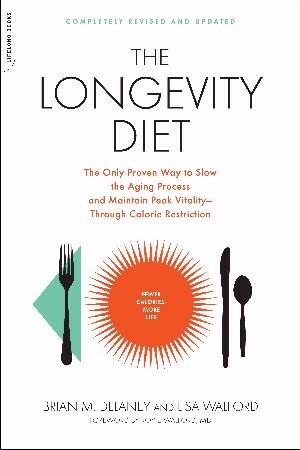 Article on longevity diets. Brian interviewed. January 13, 2006. AP Radio (will be broadcast nationally in the US). Brian interviewed. Program aired nationally across the U.S.
October 26, 2005. Health Talk, with Dr. Hoffman. Brian was interviewed about the "intriguing book about slowing the aging process via a method verified in lab animals, and, it now appears, in humans as well." October 25, 2005. Fox 11, Los Angeles, 10:00 p.m. News. Interview with CR Society member Khurram Hashmi, and Brian. August, 2005. ARD Television, Germany. Brian and Lisa were filmed and interviewed during their New York book launch. Piece shown in August in Germany. An international edition of the program is underway. July 5, 2005. New England Cable News. (Link to the segment will be here soon, we hope.) Brian is interviewed about the book and the diet. June, 2005. Good Morning America. Lisa appears with Diane Sawyer and a skeptical physician who, in the end, concluded, "this diet probably does slow the aging process." Friday, January 13, 2006. AP Radio (will be broadcast nationally in the US). Brian will be interviewed.